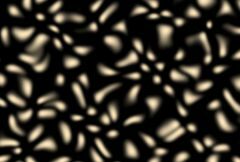 Creates a field of spots that can be distorted and animated, then combines the texture with a background clip. Radius: Default: 1, Range: 0 to 2. The radius of the spots. Adjust this to change the size of the spots without changing the number of spots. Rand Warp Amp: Default: 0.2, Range: 0 or greater. The amplitude of a bubble warping distortion applied to the spots. Rand Warp Freq: Default: 1, Range: 0.01 or greater. The spatial frequency of the noise used for the warping distortion. This has no effect unless Rand Warp Amp is positive. Warp Start: X & Y, Default: [0 0], Range: any. The translation offset warping pattern. This has no effect unless Rand Warp Amp is positive. Warp Speed: X & Y, Default: [0.5 0], Range: any. The translation speed of the warping pattern. If non-zero the spots are animated to wiggle at this rate. This has no effect unless Rand Warp Amp is positive.